Gett, the ride hailing company for business and consumer rides, is launching a major new initiative to deliver Carbon Neutral rides in further efforts to reduce CO2 emissions in the UK. The company is reducing its carbon output as it continues to support the adoption of hybrid and electric vehicles across UK cities. Gett will also now give its London business clients the opportunity to ride ‘carbon positive’ through the Gett app, simply by paying 20p extra per ride. These additional funds will be donated to the 12 central London schools identified in the Mayor of London’s school air quality audit programme. The company is also offsetting 7,500 tonnes of CO2 – the amount it is expected to produce through all business and consumer rides in the following 12 months – by investing in accredited carbon reduction projects provided by Carbon Clear. In what is a first for a major taxi company in the UK, Gett’s yearly CO2 emissions from its rides will be offset by Carbon Clear, the climate and sustainability consultants. Gett’s business booking platform, One Transport, gives clients access to the largest black cab and Private Hire mixed fleet in the UK, and through various accredited and recognised global energy solutions they will offset their carbon output in projects that take urgent action against climate change. It is important for global corporations like Gett to have a strong Corporate Social Responsibility to showcase their environmental concerns for the planet. The company will be investing in a Wind Power Generation project in India that displaces the burning of fossil fuels, and the Madre de Dios Project in the Peruvian Amazon that dramatically reduces deforestation. As well as offsetting their carbon emissions across all Gett and One Transport business rides, Gett is offering London cab customers the opportunity to turn their ride ‘carbon positive’ by paying an optional 20p extra per journey. By simply selecting Gett Green on the app when booking a black cab, riders can help contribute to other clean air projects. Part of the funds raised from Gett Green will be donated on an ongoing basis to the 12 central London schools identified by the Mayor of London’s school air quality audit programme. The audits, supported by TfL’s Local Implementation Plans, have made recommendations to reduce emissions and exposure to CO2 around London’s schools. The schools will be able to use the money from Gett Green to help with measures to serve their air quality goals, as outlined in the Healthy Schools London programme. In further efforts to reduce the carbon output from its rides, Gett is continuously supporting the adoption of LEVC TX Electric Taxis in London, Coventry, Edinburgh and Glasgow by promising electric cab drivers that zero commission will be taken on all fares with Gett for their first six months of driving with them. These are the first fully-certified electric taxis to be introduced to the streets of the UK, in a pledge to reduce pollution levels in the dangerously contaminated air. As Gett works with cities existing infrastructure, it does not add any extra vehicles to the UK’s already congested streets. 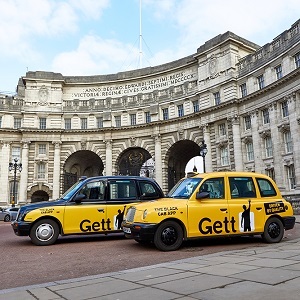 Through electric black cabs, Gett is supporting efforts to improve mobility in UK cities by reducing the number of vehicles on the road, and therefore also pollution levels in the UK. Matteo de Renzi, Gett’s UK CEO says, “Air quality is increasingly becoming more of an issue, not just in London, but across the UK. By becoming Carbon Neutral we’re incredibly proud to be helping cities achieve cleaner air and reduce pollution levels, something that our business clients consider imperative. Offsetting the CO2 our UK rides produce we will positively impact multiple climate projects across the globe. Mark Chadwick, CEO of Carbon Clear says, “We are proud to partner with Gett to help them provide their customers with carbon neutral journeys. The science tells us that carbon neutrality is necessary to protect the planet and sustain our livelihoods. Companies making bold commitments to carbon neutrality are taking the lead in climate action. The offsetting projects that Gett are supporting are subject to rigorous international standards to ensure they deliver the promised emissions reductions. As well as this, these projects support sustainable development in international communities and have a tangible impact on people’s lives”. The Gett app is free to download on iOS and Android.